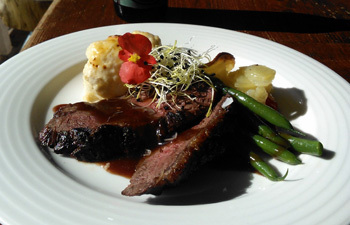 The Garden Restaurant | Fine dining and splendid views in Frigiliana’s old quarter. Josper roast picanah with roasted aubergine begendi and cauliflower cheese, green beans with sweet fennel dressing, patatas a lo pobre, red begonia and onion sprouts. 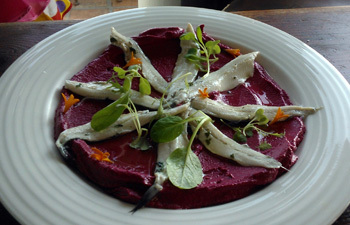 Anchovies in oil and garlic, roasted beetroot tahini, mini herbs and micro Tagete flower. 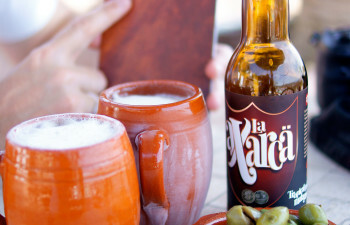 La Axarca artesan ale from the Malaga region.